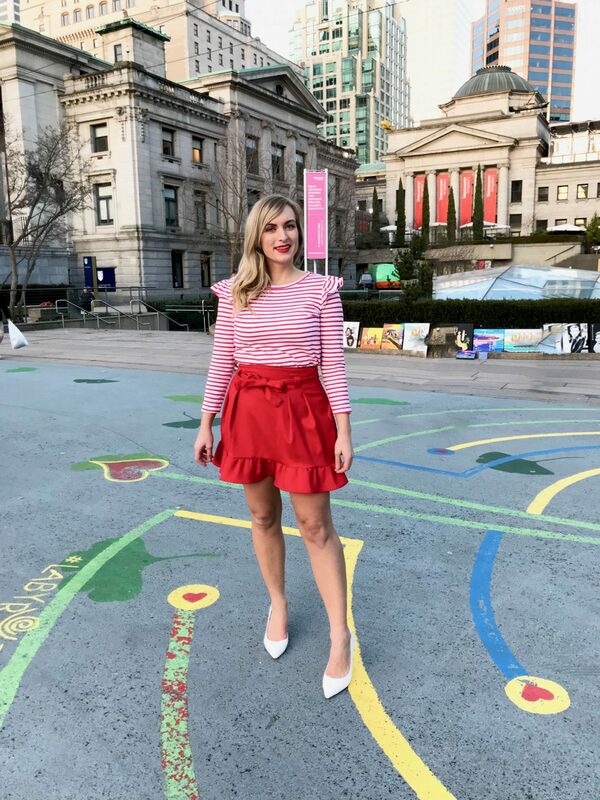 With Valentine’s Day less than 2 weeks I away, I couldn’t resist getting into the holiday spirit with some fun Valentine’s Day outfit ideas (or Galentine’s Day!) 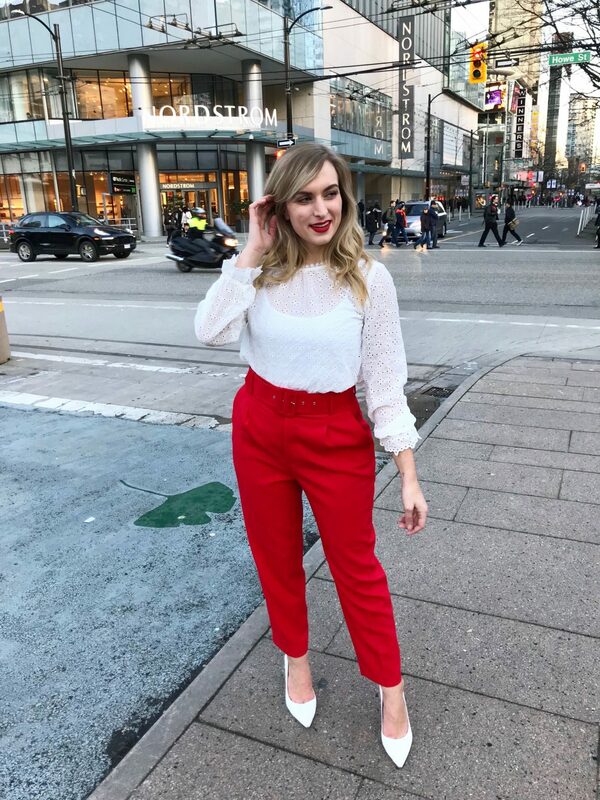 Being single, I’m not going to be doing anything particularly fancy for Valentine’s Day so I wanted to style three looks that would be perfect for a casual valentine’s day date or – what I’m going to be doing- a Galentine’s Day brunch! I fell in love with this dress the moment I saw it! The high neckline and long sleeves is a nice contrast to the mini length and the girly ruffles. I paired it with my white polka dot socks and white heels. Socks with your heels is a fashion trend that I am loving for it’s cute and vintage vibes. These polka dot socks are perfect for a Valentine’s day outfit, or to be paired with any fun dress. The socks also come in black polka dot, and I actually have those as well. For this outfit I also added a bold red matte lip. This lipstick is one of my drug store favorites because it lasts really well throughout the day (I can eat and drink and still have it on) and I like the liquid lipstick application. I just love this ruffle shoulder striped top; it feels so Parisian! I definitely plan on wearing this top a ton this year paired with black denim & comfy oxfords. 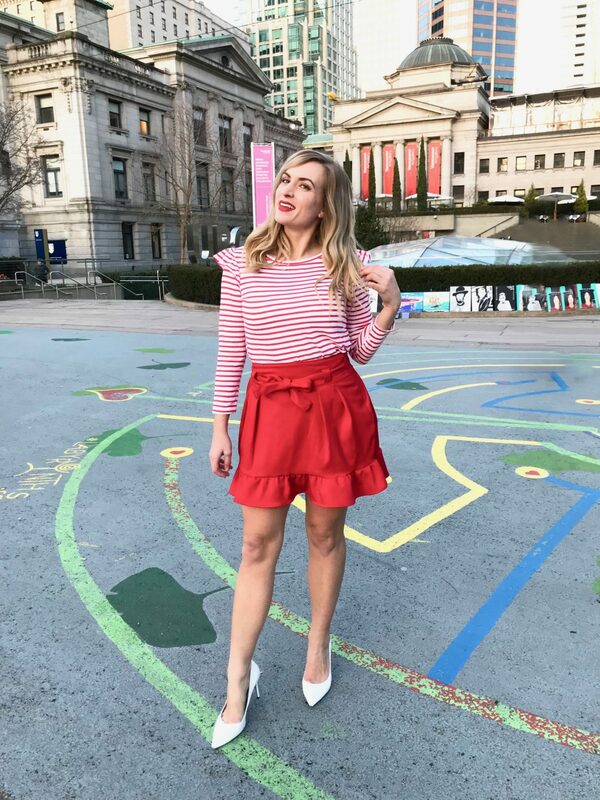 For a Valentine’s Day outfit though, I love it paired with this flirty red mini skirt. This skirt is petite so I’d size up one size if you’re taller, just to make sure you have the length you need. I’m usually a 4/6 (but 8 in H&M) and this is an 8. Again I wanted to keep this look youthful and fun, so I went with my bold red matte lip and my trusty white high heels. I hope you found some outfit inspiration in these 3 looks. 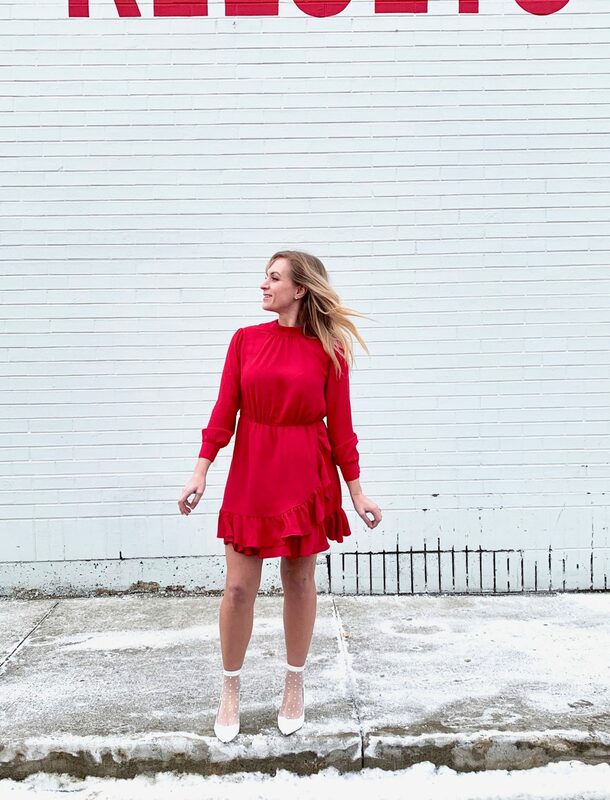 I’d love to hear about what you are up to for Valentine’s Day, and if you’ll be celebrating Galentine’s day with your friends as well! "The Best and Worst Drug Store Mascaras"
I love how you added those fun socks! These three looks are perfect! Thanks girl! I’m so into that trend at the moment! You’re the cutest little Valentine! Love the red dress and red pants. Aw I love all three looks so much! Those socks are adorable – definitely my favorite addition. I am HERE for these looks, girlfriend. Seriously cute. The sock/shoe situation in the first outfit is everything, the cigarette pants in the second outfit have me swooning, and that last outfit is just so Taylor Swift cute I can’t even handle how much I love it! Haha awww those descriptions are my favorite ever!!!! Thank you!! I am loving these 3 outfits! I love the socks you added, and the white heels with the second outfit! You really pull off the socks with the heels! I love the look and the last one is my favorite. Love the outfit ideas … those colors are calling me out. I love all three outfits. 1 is so cute and 3 is definitely my style. I really need to check out those cute socks from the first look though. Aw thanks so much girl!! All three are fabulous outfit ideas! I think the second one is my favorite. Thanks girl, glad you like them!! Your red and white looks are so simple and perfect! I really love the polka dot socks you added! I Love all these looks so much, I can’t pick my favorite! Such a great color! I love these red and white looks! You look adorable and festive!